The picture above was taken in Pasig City in the Philippines. 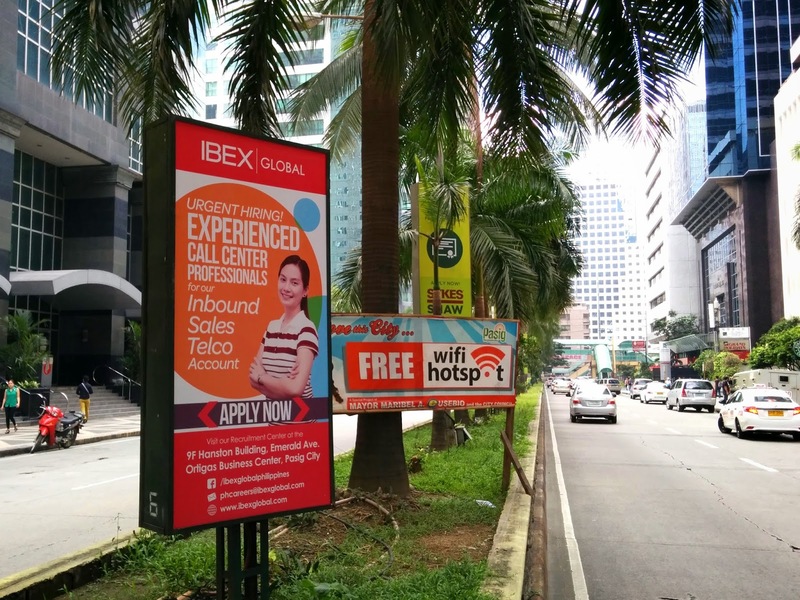 The poster advertising free wifi is symbolic of the changing connectivities of a country in which more than 30 million people are now Internet users. Whereas the advert on the the left is symbolic of how many in the country have harnessed those new connectivities: setting up business process outsourcing (BPO) firms and performing digital work. This, however, is a relatively old story and there are millions of people around the world working in the outsourcing sector. But, in the last few years, we have seen some important changes. The rapid growth of online freelancing, digital work, and microwork is undoubtedly changing the landscape of digital work: creating jobs in people’s homes and internet cafes rather than in the kinds of offices full of BPO firms in the photograph above. These changes could be seen as an important moment in the trajectory of global development: offering millions of skilled and unskilled workers in low-income countries access to jobs. But many concerns also exist. Not only are workers placed in potentially precarious positions, they also are potentially enrolled into new digital sweatshops with little opportunity to upgrade their positions. It is in the context of those very different ways of understanding the intersections between digital labour and development, that my colleagues Helena Barnard, Vili Lehdonvirta, Isis Hjorth, and myself are embarking on a 30-month project to understand contemporary virtual production networks. What is the overall landscape of virtual production networks in Sub-Saharan Africa and Southeast Asia? What factors explain the network structures that we see? How are these networks changing over time? Who benefits from SSA’s and SEA’s virtual production networks? How do observed changes differ from public, political, and academic discourses surrounding potential effects? We are using a combination of quantitative (using log data from work platforms) and qualitative (six months of fieldwork) methods and plan to regularly release and share our findings. Changing connectivities are undoubtedly profoundly influencing the landscape of digital work: enabling new flows, new networks, and new geographies. By studying virtual production networks in some of the worlds economic peripheries, we hope to ultimately understand who benefits and who doesn’t from these new forms of work. The map below visualises the article length of every English-language Wikipedia article in Japan, Taiwan, the Korean Peninsula, and eastern China. It is Japan that really stands out on this map. The country glows with content in contrast to its neighbours which have much sparser layers of information defining them. The yellow dots in linear patterns that crisscross the country suggest that some diligent editors have been creating a lots of short articles about the entirety of the Japanese railway system (e.g. the list of every station in the country). Even ignoring the prominence of information about the Japanese rail system on the map, you can see that the Tokyo-Yokohama metropolitan region is represented by a thick cloud of information that is much broader than the equivalent layers of articles about Seoul, Shanghai, Hong Kong, and Taipei. Some of this can be explained because Tokyo is a larger city, but it also remains that there is simply more information created about Japan than any other country in the region.